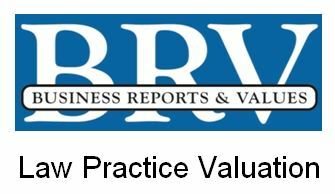 Law Practice Valuation follows the same principles as the valuation of other businesses. Many concerns are the same, such as the practice being dependent on a single individual, and how many referrals are obtained because of the individual. The business: hard assets (cash, equipment, furniture, leaseholds, and the like) less outstanding debt or lease obligations that are a part of the business. The practice-sources of immediate revenue, and a system for generating future revenues. If the most valuable asset conveyed in the transfer of a law practice is the practice itself, then, essentially, what is conveyed is the goodwill of the lawyer. 1. Determine the firm's net assets on an accrual basis. 2. Reconstruct net income by adding back benefits, "perks," and compensation to reported net income and subtracting a reasonable compensation package. 3. Calculate reconstructed net income for three to five years and average. 4. Multiply net tangible assets from the above figure by a reasonable return rate. 5. Subtract the reasonable return from average reconstructed net income (the result is excess net income). 6. Capitalize the excess net income to arrive at goodwill. The value of an individual's practice depends on his or her ability to attract and retain clients. Therefore, that value is personal to the lawyer. Even when client relationships are transferred, it is ultimately the new lawyer's personal ability and relationship with the client that determine whether the client will stay or leave. The determining factors that influence the risk component of the valuation are several and include, the stability of the client base, ability of remaining lawyers to perpetuate the business, name recognition, type of practice, profitability, size of firm, stability of partner group, reinvestments to fund growth, risk taking, and the like.